Liberation: May 9, 1945, by the Russian Army. The "soap factory" of Rudolf Spanner. The thought of establishing a camp for “undesirable Polish elements” was born among the Nazi authorities of the Free City of Danzig long before the war broke out. As early as 1936, the police began to monitor the activities of Poles, and to compile material, which, in 1939, served as the basis for determining which Poles would be arrested first. In July 1939, a special SS troop was established — Wachsturmbann Eimann — to find sites and organize detention camps. In the middle of August 1939, the site for the future concentration camp Stutthof was selected. Stutthof is 34 km from Danzig and was the first concentration camp created by the Nazis outside of Germany. It was also the last camp liberated by the Allies. The moment the Nazis invaded Poland, massive arrests of Poles in Danzig started. On the first day of the war approximately 1,500 people were arrested, mostly Poles active in social and economical life, and activists and members of Polish organisations. From those arrested, a group of 150 people was selected and transported to Stutthof on September 2, 1939. Two weeks later, on September 15, 1939, 6,000 prisoners were in the camp. Most of them were executed by the SS. 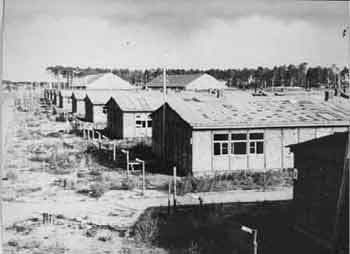 The camp was composed of eight barracks for the inmates and a huge building (the "kommandantur") for the SS. It was called “the old camp.” In 1942, the SS began to build a "new" camp: 30 barracks were added. In 1943, the Nazis added a crematory and a gas chamber. 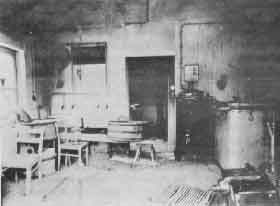 The gas chamber had a maximum capacity of 150 people at one time. When the SS had too many people to execute, they also used wagons as gas chambers. Between September 2, 1939, and May 10, 1945, 127,000 prisoners were registered upon their arrival in the camp. The lowest estimation of the number of victims is 85,000. The real number is certainly much higher; the inmates who were selected for immediate execution at their arrival were not registered. The original commander of the camp was SS officer Max Pauly. After the war, Pauly was tried by an Allied tribunal and sentenced to death. 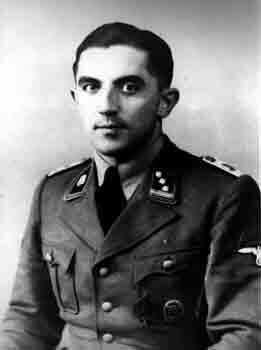 He was succeeded by SS Captain Werner Hoppe. Despite the evidence of his participation in hundreds of murders, the court sentenced Werner Hoppe to nine years in prison. These are the names of other SSmurderers: 1st SS Lieutenant Schwarz, SS Lieutenant Dittmann, 1st SS Lieutenant and MD Otto, 1st Lieutenant Oerli, SS Lieutenants Mathesius and Neubauer. 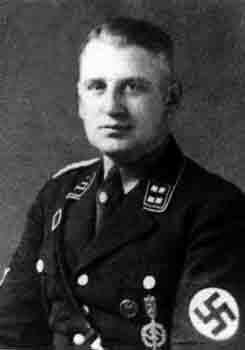 Professor Rudolf Spanner, an SS officer and "scientist," was owner of a small soap factory located in Danzig. In 1940, he invented a process to producesoap from human fat. This "product" was called R.J.S. - "Reines Judische Fett" - which means "Pure Jewish Fat." Hundreds of inmates were allegedly executed for the "production" of soap. Rudolf Spanner was very proud of his invention. Following testimonies of some survivors, he used to spend hours and hours just to admire his "invention." 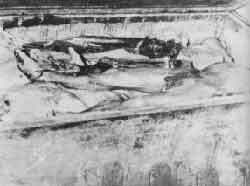 At liberation, the Allies discovered chambers full of corpses used for the production of soap. After the war, Rudolf Spanner was not arrested and continued his "research." Stutthof served mainly for extermination of the most aware and patriotic Poles, particularly from the educated circles in Danzig and the Pomorze Region. Beginning in 1942, transports of Poles arrived and were directed not only by police units from Danzig-West Prussia, but also from other regions of the occupied country. At this time Stutthof became an international camp. In June 1944, it became an instrument of the final solution and a mass extermination camp. Within five years of its creation, Stutthof grew from a small camp intended for 3,500 prisoners (in 1940) to a complex of 39 subcamps that held 110,000 people from 25 countries. Among the prisoners were Poles, Jews, Russians, Ukrainians, White Russians, Lithuanians, Latvians, Estonians, Czechs, Slovaks, Finns, Norwegians, French, Danes, Dutch, Belgs, Germans, Austrians, English, Spanish, Italians, Yugoslavs, Hungarians, and Gypsies. During their incarceration, prisoners were exposed to slave-like work, malnutrition, terrible sanitation, disease, and mental and physical torture. An estimated 65,000 people died as a result of the living conditions, as well as executions by shooting, hanging, gassing, lethal injection, beatings and torture. Stutthof was liberated on May 9, 1944, by troops of the Soviet Army — the 48th Army of the 3rd White Russian front. Sources: National Stutthof Museum; Forgotten Camps; Commandant photos from the Museum.